Healing spirit is the most criticized new spell in Xanathar’s Guide to Everything. Its design has been heatedly discussed on our own forums, on the D&D Reddit, and every message board and social network in between. It has been almost universally denounced by online fans of D&D as utterly broken, and in desperate need of houseruling, official errata, or even outright banning. But is healing spirit really that broken? And if it is, what about it needs to be changed in order to fix it? These may sound like silly questions to ask, but a good game designer (and I firmly believe that all good Dungeon Masters must also be good game designers) should look at every spell, class feature, and racial trait from all angles. Let’s take a look at healing spirit—where it succeeds, where it fails, and how you can change it to fit your game. What Does Healing Spirit Do? Requiring only a bonus action to cast, the caster can concentrate on this spell for up to 1 minute, creating a healing spirit that fills a 5-foot cube within 60 feet of them. Whenever a creature you can see enters the spirit’s space for the first time on a turn or starts its turn there, you can choose to have the spirit restore 1d6 hit points, requiring no action. This spell can be cast using a higher level spell slot, increasing the healing by 1d6 for each slot level above 2nd. This much-maligned spell is not without merit. If it weren't, people would just discard it instead of trying to find ways to fix it! 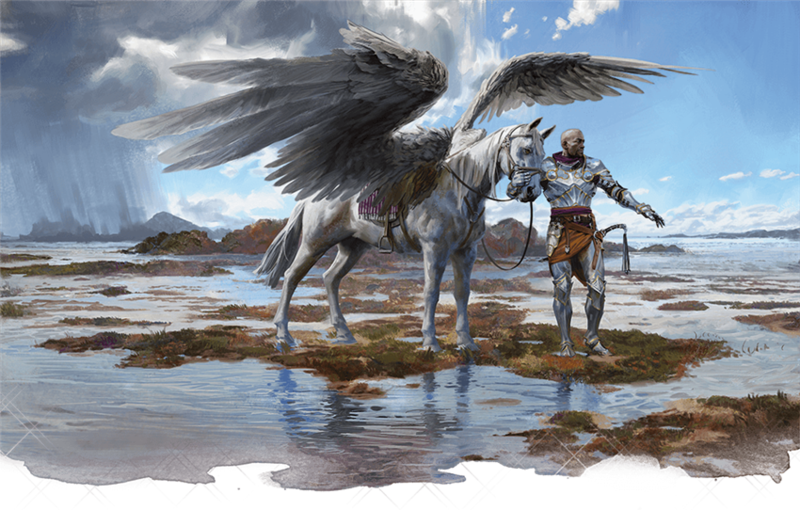 Healing spirit fills an important niche in fifth edition D&D’s design that no other spells cover: powerful in-combat healing. As a spell exclusive to the druid and ranger classes, it helps players who want to play a druid or ranger fill an important healing niche in parties without a cleric. One of the design goals of fifth edition D&D was to let people play with any party composition that they wanted—and one of the main barriers to this style of play was the perceived necessity of the cleric. Giving a powerful healing spell to druids and rangers is a step towards democratizing healing, in the same vein as giving all classes hit dice to use as a healing resource. It’s generally considered less efficient to spend spell slots on healing compared to spending them on damage. Compare cure wounds to guiding bolt. One deals 4d6 radiant damage (an average of 14 damage) and grants advantage on a successful hit and grants advantage to the next attacker’s attack roll, while the other restores hit points equal to 1d8 + your spellcasting modifier (an average of 7, assuming you have a +3 spellcasting modifier). Guiding bolt deals twice the damage that cure wounds heals, and has a bonus effect. Even if you take into account the fact that guiding bolt can miss its target and cure wounds always “hits,” as long as guiding bolt hits more than half the time, it’s a more efficient use of a spell slot than healing. Healing spirit is a healing spell potent enough to be worth using in combat. It only requires a bonus action to cast, and, with some clever positioning, can restore 1d6 hit points to each of your allies each turn. While in combat, this element of tactical positioning can be an interesting puzzle for the players to unravel, since they have to find a balance between aggressive and defensive positioning. This is where healing spirit really falls apart. Unfortunately, I don’t have much good to say about this spell when it comes to out-of-combat healing, either from a narrative or mechanical perspective. We’ll look at it more in the cons section. Unfortunately, healing spirit steps on the toes of other existing spells and classes in the game. As you’ll soon see, most of healing spirit’s problems arise because, while it is a balanced and fairly competitive spell in combat scenarios, it’s grossly overpowered out-of-combat. Healing spirit can cause contention in parties where both clerics and druids/rangers are present. If a cleric wants to play a support role and focus on healing and buffing, it feels unsportsmanlike to play a combat-focused ranger or Wild Shape-focused druid that also has access to a healing spell as potent as healing spirit. Personally, I feel that this is an excellent way to differentiate the healing capabilities of different classes, but the out-of-combat balance of healing spirit needs to be addressed if this stylish asymmetrical balance is to work as intended. My impression of healing spirit, after several readings of its spell description, is that it was balanced around its usefulness in combat (compare its 1 bonus action casting time to prayer of healing’s 10 minute casting time). As it stands, its concentration requirement makes it an unattractive option in combat, especially since so many of druids’ 2nd-level spell options require concentration. In fact, only six of druids’ twenty-three 2nd-level spell options don’t require concentration: animal messenger, darkvision, find traps, lesser restoration, locate animals or plants, and protection from poison. Similarly, healing spirit’s concentration requirement fights directly for the ranger’s class-defining hunter’s mark. All other small issues aside, healing spirit’s gravest flaw is its power when used out of combat. 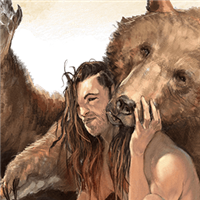 If an entire party of adventurers clusters in a 5-foot cube for the spell’s full 1 minute duration (in a sort of heroic cuddle pile, perhaps? ), each character will regain 10d6 hit points (an average of 35 hit points) at the cost of a single 2nd-level spell slot. 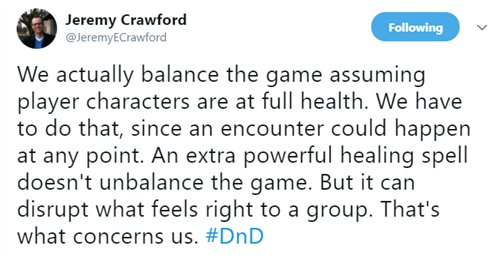 What this essentially means is that, with only a minute of rest and a single 2nd level spell slot, a druid can fully heal an entire party of 3rd level adventurers. It’s a short rest’s worth of healing in a fraction of the time, which essentially allows an adventuring party to take on any challenge at full hit points. This is where your mileage may vary. If you like to throw a small amount of very challenging encounters at your players, then you’re probably designing all of your encounters with the assumption that your players will tackle them at full hit points anyway. This encounter design philosophy leads to a very heroic style of play, where just about every encounter is a major cinematic moment. If that’s your playstyle, then healing spirit’s out-of-combat potency isn’t a problem at all. It may still present other problems, but this isn’t one of them. In fact, it’s the way the fifth edition D&D is balanced. However, if you like to play a grim-and-gritty D&D where adventuring is all about carefully conserving your resources in grueling dungeon crawls and being slowly worn down by constant small combats… then this presents a huge problem. First of all, starting every combat at full hit points is antithetical to this style of play. Second, healing spirit is so much better at restoring hit points out-of-combat than it is at restoring them in-combat (its supposed primary function), that the most efficient way to conserve precious resources is to only use it out of combat. Finally and most importantly, it is so much more powerful than comparable spells of prayer of healing (available only to 3rd-level clerics) and aura of vitality (available only to 9th-level paladins) that it makes a druid a better cleric than a cleric and a ranger a better paladin than a paladin, as far as healing is concerned. This thread from the D&D Beyond forums sums the math of this issue up nicely. Jeremy Crawford, managing editor of fifth edition Dungeons & Dragons, frequently answers player-submitted rules questions on his Twitter account. While he maintains that healing spirit is working as intended, it does “have the potential to exceed our expectations” in out-of-combat scenarios. In layman’s terms, the D&D team isn’t going to make a knee-jerk nerf and over-balance the spell. Instead, they’re devoting additional resources to see how this spell plays out long-term to see if it really is as much of a problem as people claim. 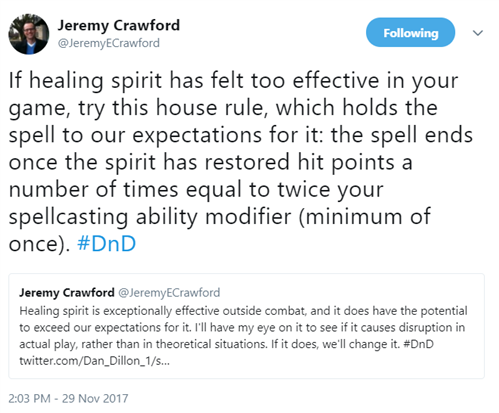 In the meantime, however, Jeremy has provided a simple house rule that brings the spell more in line with its intended power level. If a 3rd level druid with a Wisdom of 16 (+3) cast healing spirit, it would restore 1d6 hit points to any creature that passed through the spirit’s space or started its turn there a maximum of six times. If, over the course of their adventuring career, that same druid increased their Wisdom to 20 (+5), the spell could restore 1d6 hit points a maximum of ten times. This means that, at its most powerful, healing spirit cast at 2nd level now only restores an average of 35 hit points, instead of 35 hit points per creature. This is a major nerf, but it brings healing spirit more in line with prayer of healing. To compare, prayer of healing cast at 2nd level restores hit points equal to 2d8 + your spellcasting modifier to up to 6 creatures. At its most efficient, that’s an average of 84 hit points (2d8 rolls an average of 9, plus 5 is 14, times 6). Prayer of healing restores more than twice the number of hit points of the house ruled healing spirit, but is much less flexible. It must be cast out of combat because of its 10 minute casting time, and it only restores a small amount of hit points to each creature, whereas healing spirit allows you to specify how much healing each creature gets. For more of the tweets Jeremy has made in response to this spell at the height of the outcry, you can check Zoltar’s Sage Advice blog. Remove the spell’s concentration requirement, making it a much more attractive in-combat option. This limitation does nothing to make it less powerful outside of combat, so removing it doesn’t break anything. Causing the spirit to heal requires you to use your reaction when a creature enters the spirit’s space for the first time on its turn or starts its turn there. Replacing “(no action required)” with “as a reaction” limits the spell’s healing to a maximum of 10d6 without having the spell scale multiplicatively with spellcasting ability modifier. I can’t think of any other spells that increase their effective duration based on ability modifier, just spells like cure wounds which add healing based on your spellcasting ability modifier. Until the spell ends, as a reaction when you or a creature you can see moves into the spirit’s space for the first time on a turn or starts its turn there, you can cause the spirit to restore 1d6 hit points to that creature. The spirit can’t heal constructs or undead. At Higher Levels. When you cast this spell using a spell slot of 3rd level or higher, the healing increases by 1d6 for each slot level above 2nd. When you get right down to it, healing spirit needs some changes. It gives druids and rangers an effective healing spell (hooray!) but it steps all over the cleric and paladin’s comparable healing spells (boo). It you play a heroic game, it lets you start every major fight with full hit points (yay! ), but it singlehandedly makes an attrition style of dungeon-crawling play unviable (yikes). Fortunately, D&D is a game played by humans who can make house rules as they see fit, not a game governed by strict computer programs. Unfortunately, the major problem with not having any official errata on this spell means that my house rules, Jeremy’s house rules, and (most importantly) your house rules are all illegal in D&D Adventurer’s League games. And unfortunately… I have no solutions for that. If you’re having a problem with healing spirit making your AL game less fun, your only recourse is to talk with your players and hope they’re mature about it. 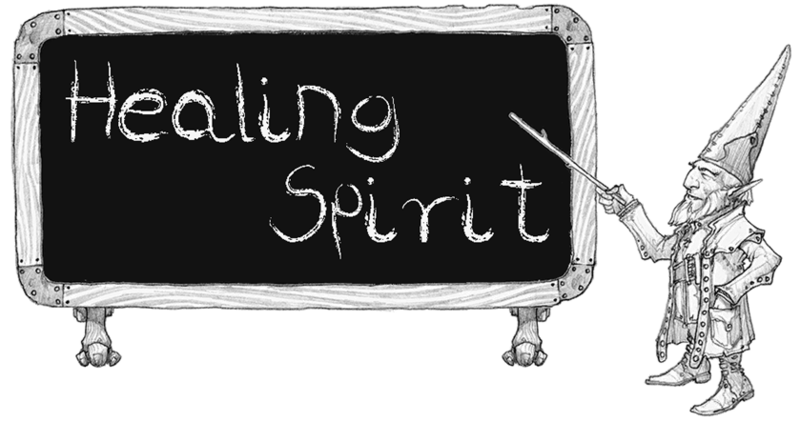 What have your experiences with healing spirit been? I’m interested in what you think of Jeremy’s “official house rule,” and the house rule I’ve provided here, and I also want to know what you have done in your home game to address this spell! James Haeck is the lead writer for D&D Beyond, the co-author of the Critical Role Tal'Dorei Campaign Setting, and a freelance writer for Wizards of the Coast, the D&D Adventurers League, and Kobold Press. He lives in Seattle, Washington with Mei and Marzipan, two fey spirits in the form of small fuzzy animals. You can usually find him wasting time on Twitter at @jamesjhaeck. Great post! 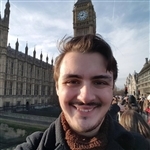 You've become one of my favorite writers on this site, and I love sharing your guides and advice with my players! I really like this solution; it's elegant and doesn't greatly alter the original spell's mechanic. My only concern with healing spirit is in "competition" (as it were) with Clerics. For the cost of a 2nd-level spell slot - of which Rangers don't have a lot! - you get part of the benefits of a short rest without spending hit dice. Note that this doesn't top everybody off that well once you get to mid levels unless you spend higher level slots. It does make prayer of healing a bit useless. But at the same time... how often does that "unbalance" your encounters? As pointed out, how often do you grind people down without short rests? Generally speaking, even in dungeon situations (e.g. the Tomb of the Nine Gods) my players can take a short rest between encounters. If they're spending a spell slot to restore HP but don't let the fighters and warlocks and bards recover resources, then that's fine by me. In fact, that probably makes them even weaker because those things are even more important, especially at higher levels. I have a druid in my ToA campaign that uses healing spirit both in combat and and out. I can honestly say its been just fine. I doesn't feels broken at all. In combat it adds a level of tactical play, and they learned the hard way about stacking up in one combat vs a wizard and ate a lightning bolt. OOC it really hasn't been that big of an impact. One additional thing to consider is they only have so many spell slots to burn as well. My initial feel was wow this is broken OOC but at the table it just really hasn't been an issue. The actual wording in the spell is this; "Until the spell ends, whenever you or a creature you can see moves into the spirit’s space for the first time on a turn or starts its turn there, you can cause the spirit to restore 1d6 hit points to that creature (no action required)." Technically there is no "turns" outside of combat, right? No initiative means no turns since everyone acts what they want, when they want. No turns, no healing from Healing Spirit as you can't move into the spirit's space for the first time on your turn or you start your turn there if turns don't exist outside of combat. Keeps the spell as what it was probably intended for, healing to be used in combat, and not a conga line for unlimited healing outside of combat. Now in combat it could still can be used as a conga line through the spirit since it can also heal when someone moves into the space during their turn in initiative however I don't think in-combat conga line use is too broken since it's only a 5ft square and moving through could provoke opportunity attacks and such. Other then that, I do like the spell modifier thing that was brought up where you only get a number of healing "hits" equal to double your ability spell modifier outside of combat. Decent jumps in healing when you increase your ability spell modifier (two more +1d6hps hits with Healing Spirit instead of +1hps more with traditional healing spells like Cure Wounds when you go from +3 to +4). Currently I've been doing just 10 hits, so I let the players decide on splitting up the the 10 1d6 hits they get from the spirit among the players that need healing but I think I might go with the ability spell modifier thing instead to keep it somewhat in check (since having a +5 ability spell modifier would be what, a minimum a level 8 character?). I appreciate the attention drawn to those house rule options - I remember seeing some of the furor but didn't keep up to date on Jeremy Crawford's proposal of a house rule. Now I've got private homebrew copies of those house-rule options in D&D Beyond for the next time a player creates a Druid or a Ranger in my campaigns. Thank you for your work, James! I really love this spell as written for in-combat, so for me personally, I think I would just house rule that the spirit is more effective when the caster's adrenaline is pumping (AKA in combat), and can heal any number of creatures, but only one creature at a time, up to 10d6 split however you want, outside of combat. If the players attempt to rules lawyer it by attempting to carry around a hostile creature or get adrenaline pumping another way, I think it would be more telling of the players attempting to abuse it anyway. This, however, means nothing for official wording, because I can't really think of a way to word that for official ruling purposes. 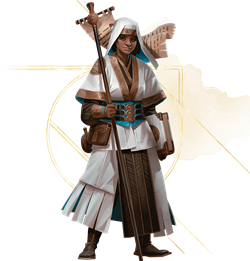 I also had issues with Healing Spirit, to the point that I avoided recommending it to the guy playing a Druid in our party for Tomb of Annihilation, a campaign meant to be over the top hard. I'm glad you acknowledged this and proposed a solid fix. I'll show this to my DM. I think you nailed it. There is some problem with the Hunter, which can have several viable reactions, but I think that's a minor quibble. I think the only real criticism is that you DO nerf the spell a little in combat by preventing multiple characters per turn from being healed. Still, I think this puts the spell in a lot better shape and is just a superior version. Great job. More elegant than my solution. I very much agree that it is extraordinary out of combat and I was thus searching for ways to restrict it's healing to those cases. It broke the ludonarrative if I had it straight up say it only worked during combat or when acting in turn order. Instead, I thought about restricting it's healing properties to when somebody is taking damage in the AoE. At that point it's effectively a damage reduction spell most of all but the flavor would still remain and I actually really like the idea of spirits immediately tending to the wound you just took. It just can't be used to heal anyone up more than the health they are at when its cast (almost forcing you to cast it early or not at all). All that said, I've yet to be in a situation where I minded the "competition" problem problem of it all. I don't mind classes overlapping especially if you have to take specific options before those overlaps happen and sacrifice another option in the process. As a player, I once had my protection cleric die and needed to at least consider a replacement in case I couldn't get resurrected. I wanted to assure we still had a viable party so I needed to somehow still fulfill my role as a tanky, melee support. I didn't want to go cleric again and Paladin would also feel way too similar to a protection domain cleric of Bahamut. Instead, I looked into moon druid for a completely unique flavor from my cleric. Healing Spirit would be the most viable option for my cleric to provide healing while wildshaping. It steps on the cleric but that's the good thing! It can fulfill a specific mechanical role while providing a completely different flavor. I think the game could easily have more of that. I considered addressing in this way, but eventually decided against it. If I were to rule that it could only be used in combat, I would word it as "The healing spirit can only heal when you can see at least one hostile creature." LOL I have been using the spell wrong for me Healing spirit would only heal at of the end of my turn for one person. As a result the 10d6 hit points was split among the party not everyone gets the 10d6 hit points.This variant has been perfectly balanced for my party so I would recommend this slight change as another option. Also this was a great read thanks @jamesjhaeck . That's a good way to word it, if it was just for combat, yeah. What I was implying, though, was that it was still effective out of combat, just with a limitation. That being: RAW for in combat, and "to a maximum of 10d6 outside of combat"
Things could get murky in very specific situations, like if it was cast in combat, but the combat only lasted two rounds - in which case I would rule that it would disappear immediately if it had already healed 10d6 or more in those two rounds, or stick around until it capped out at 10d6, but I think if I told this to my players, they would understand what I was getting at. Though, again, for official rulings, this probably wouldn't hold up as well. Because it would require several paragraphs of text :B Simple for house rules, not so much for official rules and/or min-maxers. "The healing spirit vanishes once it has healed 40 hit points (+20 hp per slot level above 2nd)." Brings it closer to other healing spells. Just requires a bit of calculation on player's part. However, there are precedents RAW; e.g. "Guardian of Faith" spell. GREAT POST!!!!! It seems to me that people are forgetting about house rules. The rules in D&D are not set in stone. DMs and groups can make changes to the rules or remove them to suit their play styles. If you have a spell you don't particularly like change it or don't use it. In the case of Healing Spirit, you can limit it for use in combat only and if your group doesn't have a cleric. You can further limit's ability so that it is only heals a single character at a time. There are a number of ways to make changes to it, just like James Haeck mentioned. Technically there is no "turns" outside of combat, right? No initiative means no turns since everyone acts what they want, when they want. No turns, no healing from Healing Spirit as you can't move into the spirit's space for the first time on your turn or you start your turn there if turns don't exist outside of combat. This is really pushing the limits of a technicality. Rounds represent 6 second intervals. Turns represent what a player is doing during that 6 second interval. Inside combat/high pressure situations (defusing a trap, escaping a flooding room, etc) Rounds/Turns are used as a way to make the game function well. But in reality they're just intervals of time. If you want to open up this can of worms, something that "takes damage on its next turn" from poison or an inflicted condition wouldn't happen if you killed the creature that inflicted the effect and ended combat. Also there's a variety of spell effects that are clearly can happen out of combat that break if turns don't exist all the time Web, Command, etc. Turns always exist. Trying to get rid of them breaks more things than it fixes. The main issue I have with Crawford's suggested house rule is that it requires someone to track the number of times it has been used, which can be a big PITA and possibly a point of contention between player and GM if they remember things differently. Instead, I would lean more on the Concentration mechanic, not less. A house rule I would consider is this: Every time the spirit would heal someone, a DC 10 concentration check is required on the part of the caster. It makes some narrative sense, as the caster must decide whether or not a creature gets healing when it enters the spirit's space, so it demands at least a small piece of their attention in addition to the concentration required to maintain the spell at all. It isn't terribly difficult to make that DC, nor should it be, but the statistical likelihood of failing that check at least once over the course of a minute is very high and that chance increases parallel to party size. Having to use your reaction limits the total number of hit points this spell can restore during combat. I feel that this limits the spell in doing its intended purpose of combat healing. In other words, I like the max healing based on spellcasting ability modifier limit better. However, I find both of the proposed solutions to be acceptable improvements to the official healing spirit spell.